When you’re a hotel kitchen manager, your life is ruled by the demands of your job. There are always so many things that need to be accomplished each day to ensure the kitchen continues to run smoothly. Your mental list of tasks that need to be done is always running, from sun up to sun down, and often far beyond that. Now that 2016 is upon us, have you taken any time to consider what could improve your daily routine? Many people are interested in decreasing their stress levels, and kitchen managers are no different. What could you change to make your kitchen run more smoothly without you having to be involved at every step? Perhaps you could delegate more tasks to others, hire an assistant to take care of some of the more menial tasks, and rely on your team to be more self-motivated and assertive on their own. Who knows, maybe there will even be an increase in morale when kitchen workers are more in charge of how they accomplish their work. You could also think about other ways to streamline your workday. There are so many different areas of tasks that need to be taken care of – perhaps there are a few that you could hire out to companies that support commercial kitchens? 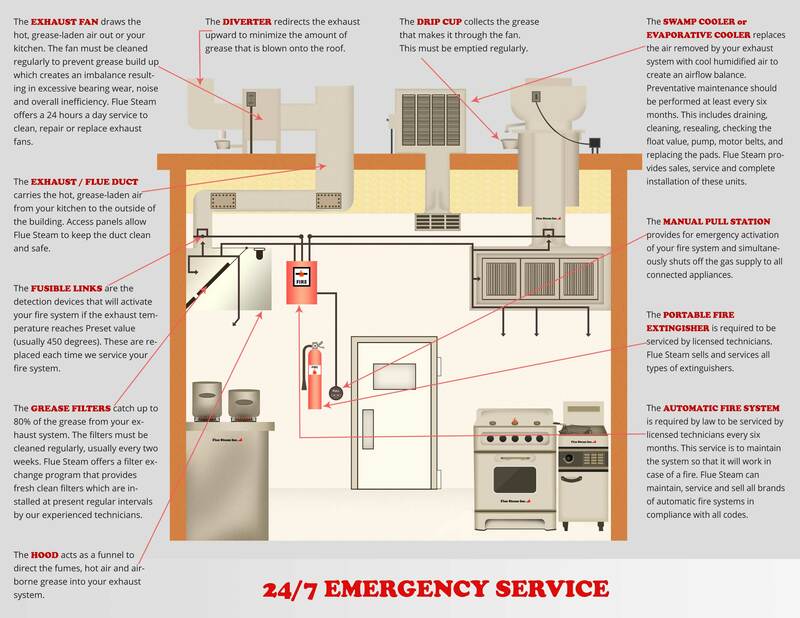 For example, Flue Steam support commercial kitchens throughout Southern California with fire safety and air ventilation needs. We can set up a regular schedule to clean your commercial kitchen’s flus (both steam cleaning and hand-scraping services), handle all fire safety tasks to make sure your kitchen is always perfectly safe and up to code, and various other menial tasks so that you can focus on other matters. Starting your partnership with Flue Steam is easy—just call 800-700-FLUE and we’ll discuss your kitchen’s needs and recommend services to meet your needs perfectly. You’ll immediately be able to take a load off when you know that Flue Steam is taking care of your air ventilation and fire safety tasks. Imagine crossing off all tasks related to these two important areas! It’s possible when you call 800-700-FLUE. We have incredibly affordable rates, we offer personalized services so you only get what you need, and we’ve been helping commercial kitchen managers have less stress for over 48 years. Find out what Flue Steam can do for you now by calling 800-700-FLUE. Happy New Year from all of us at Flue Steam!